I have a hard time believing that a city in an ancient civilization would have coped anything like that well with a similar disaster (think Angkor for example). This is quick bit of lunchtime research inspired by this Open Mind post - New Orleans seems like a prototype for worst case scenarios for cities that experience failures in their response to 21st century sea level rise. I stress I'm not trying to minimize the enormous suffering of the people of New Orleans - just pointing out that the city is still there and has a functioning economy that is only slightly smaller than before the disaster. New Orleans is clearly not going to end up as ruins in the bayou as a result of Katrina. The data are from the BEA. My impression is that even in ancient times, most cities would survive a single disaster (although not perhaps on the scale of Katrina). It generally took a succession of disasters to cause them to be abandoned. Following on from your last post, a more variable climate makes it more likely that two or more extreme weather events could hit a city in the space of a few years. Also, there are many poorer cities than New Orleans, and most urban growth in the 21st century is expected to occur in "slums". I don't think New Orleans is "worst case" in either impact or response. Nowhere near it. Curious as to just how much of the post Katrina output is due to Federal aid? Or how much is of it is due to subsidized activity like colleges? It may be that while a part of a larger system these events are able to be dealt with, but not so when the larger system runs into trouble. I'm not sure I agree that this example demonstrates conclusively that "Modern cities are hard to kill". During the aftermath, New Orleans was connected to and benefited from the larger context of civilisation. It was not cut-off logistically from the rest of civilization as it could have been. Also, there was a strong and functioning global economy to re-establish with. is of enormous economic importance. I agree that a lot of this economic activity is likely associated with rebuilding and with the inflow of state and federal aid. But I think that would be typical - any largish city that was similarly damaged would expect a similar response (indeed the federal response to Katrina was initially poorer than average which hurt the Bush administration politically). But it's more natural to me to think of the climate change risk as making NO type events more common - a hurricane here, a bout of tornadoes there, a levee collapse and flood there - but as long as we don't get to the point where a large fraction of cities are being similarly damaged in a short (few year) time period I don't see why it's likely to lead to a civilization collapse. I used to believe in things like civilization collapse. I don't anymore, at least not in the ways I used to. Different conversation though. I think drawing an analogy about all modern cities from New Orleans is a bit flawed. It is the major port of the Mississippi, and of a substantial portion of the United States' most irreplaceable export, grain. It's also of prime importance to the oil industry in the gulf. Perhaps Baton Rouge would take it's place, but if New Orleans had another major hurricane tomorrow a large city will form somewhere around there. If the economics and geography are there, a large city will happen even if it is a rebuilt one. To me a larger threat to New Orleans is the Mississippi changing it's course. Sooner or later it is going to do that. Jeff Masters had a good writeup on his blog last hurricane season. With all these out of the ordinary rainfall events, I expect it to happen in the next few decades. Heck it'll happen anyway even if things are "normal." Prof. Tainter makes the point in the video below [2:54sec] that societies run into trouble when they have to spend increasing amounts of wealth to just maintain the status quo. 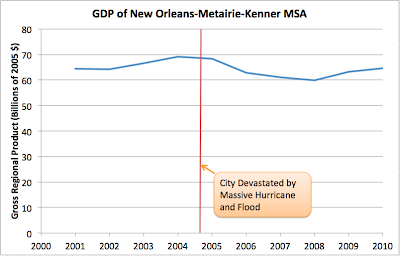 Reconstruction was probably not the primary driver of GDP post Katrina; but without the quick fixing of roads, bridges, waterways, restoration of electricity and sewage the GDP would have most likely fallen precipitously. The damage from a Katrina-sized hurricane is similar to a minor human injury that can be quickly healed by the remaining undamaged body. An EMP blast or two would be similar to a shotgun blast to the heart. It would be difficult for a technological fungus like ours to completely die without being fumigated completely with some lethal biological or chemical agent. Barring some widely dispersed technocide and with energy available, we will just grow back, like a fungus. "But it's more natural to me to think of the climate change risk as making NO type events more common"
"...as long as we don't get to the point where a large fraction of cities are being similarly damaged in a short (few year) time period I don't see why it's likely to lead to a civilization collapse." But how can anyone say with certainty that it won't reach that point eventually? I'm just saying that an evaluation of how hard it is to "kill" a modern city should take into account more than just a single city and single catastrophic event in isolation. Regardless of whether a future disaster scenario for any given city assumes "societal collapse" as an external context, it is still very likely that the future will bring increased risk of external factors that will feed back on the likelyhood of "death" for that city. James> It would be difficult for a technological fungus like ours to completely die without being fumigated completely with some lethal biological or chemical agent. Barring some widely dispersed technocide and with energy available, we will just grow back, like a fungus. This assumes that we have the energy to 'grow' back. It may not be true. Fungi are supported by a nutritious environment and can sporulate, casting millions of progeny to the winds. The mycelium infrastructure dries up and becomes lifeless. Technological humans will also see their infrastructure devoid of life and will cast their progeny into a depleted and polluted environment where any attempts at growth and development will be greatly stunted. Many low-brow technophiles will promote casting them into space, where nutritioius medium awaits. Freeze them and they will awake in ten million years when they reach the next habitable planet to destroy. Gametic cells and their DNA will be lost to the insatiable appetites of the human appendages that are supposed to insure their survival and recombination. Look at Japan, all of those great industrial ventures and their DNA is likely slow cooking with cesium and strontium. Sperm counts are falling world-wide. Pamper the body with a dopamine feast and the hell with the future. Gail Tvberg examines a related question in Can we invest our way out of an energy shortfall? and finds that we can't even invest in maintaining all of our current infrastructure, much less invest our way out of an energy shortfall. 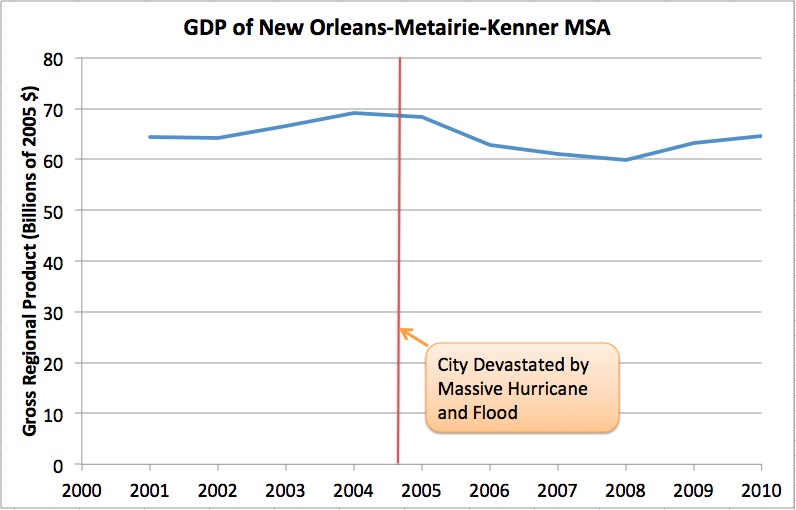 Katrina happened to come along when we could seemingly afford to rebuild New Orleans. As time goes on, it becomes very difficult to salvage major damage to our infrastructure.